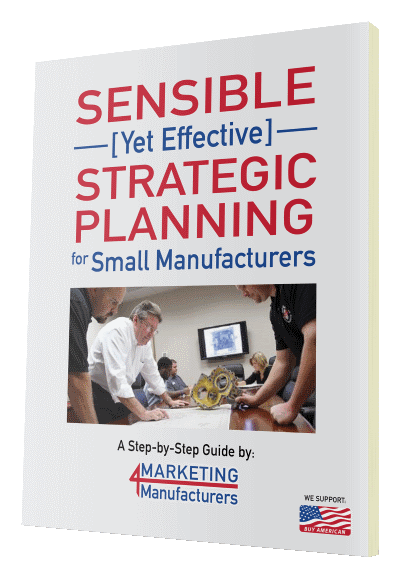 It’s no secret that tapping into the power of strategic planning methodologies is an excellent way to bring focus and direction…and ultimately, long term success to your manufacturing company. So if this is a widely accepted business principle, then why do nearly 90% of companies operate without a strategic plan — and of those that do, only about 15% are actually following their plan? The day-to-day demands on those individuals who need to participate on the strategic planning team preclude them from spending significant time away — they have no back-ups. With multiple locations and shifts, we can’t get all of the individuals who who need to participate together in the same place at the same time. We’ve never done strategic planning and there’s no one on staff qualified to facilitate or manage an effective strategic planning process. We’ve pretty much always managed things a certain way and I don’t think we’re ready for a whole new planning process. Despite the issues holding small manufacturers back, it’s still critical to establish agreed upon objectives and a clear plan to achieve those objectives. Because every resource of the company needs to be focused in the proper direction – it’s important for everyone throughout the organization to understand the big picture and how their role plays a part — this direction is determined in the strategic planning process. So how do small organizations get the most from traditional strategic planning when it may not be possible or practical for them to implement a process that could take months? They stick to the essentials and work toward building a strong foundation with what they can complete. They take baby steps into the process, focusing only on one phase at a time. And when additional input and guidance is needed, they hire outside resources with the ability to manage the planning process for them. The 5 required phases of the strategic planning process and the essence of what you must accomplish during each phase. Practical solutions that make the establishment of, and adherence to, a strategic plan possible for even the busiest companies with limited resources. We use small manufacturing company examples during each phase which helps you easily get the idea of how this relates to your business.